For our first edition of the Game Store Review, we took a trip up the road to Elmvale Ontario (just outside of Barrie) to visit Jack's on Queen. Jack's on Queen is a game store that offers a wide variety of products including; board games, CCGs, miniature games, comics, and more. Despite being in a small town, this store knows how to get the word out on the world of tabletop gaming. They are constantly holding tournaments, not just for things like Magic: The Gathering and D&D but also games like Blood Bowl and Malifaux. If you are interested in checking out any of their upcoming tournaments/game nights check out their Facebook page here. As far as prices are concerned they are competitive with other stores in the area. They are a few dollars more expensive than places like 401 Games or Board Game Bliss but this is understandable as right now they only sell Magic and Heroclix online (with an expansion coming soon) and considering their rural location. While some may not be okay with the slightly higher price remember that when you factor in gas and the time driving you more than make up the price point. Overall, Jack's on Queen is a great store with a wide selection and an amazing gaming community. So next time you are in Elmvale you should definitely swing by, Kim & Tim the owners would be happy to chat with you about games and you would likely find at least a couple events to come back for. A few weeks ago Lost Loot had the privilege of sitting down with one of the co-owners of Jack's on Queen - Kimberley (Kim) to discuss board games and their board game store. While we started off with the basics, we wanted to give our readers a little insight into the world of owning a board game store and the wonderful people who stock your favourite games and may have introduced you to this awesome hobby. What is your go-to gateway game? There are games out there for everybody. Every time I demo Tsuro it is purchased by the person I am demoing it for. It works well for all ages. It is one of the easiest sellers. Another one that we talk a lot to people about is Timeline. It is a fun gateway game. Fluxx is also a big one. Those three games I can sit down and show people and guarantee a sale. If you could bring back any game that is out of print currently, what would it be? Geez, Betrayal at House on the Hill because I was the bad guy and it was awesome. I also like Zombicide and Scythe. What a tough question, It’s like asking what my favourite song is. What genre? 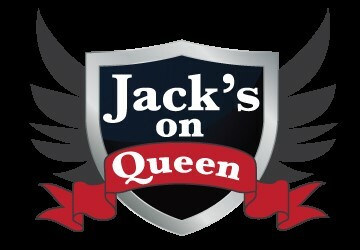 Where did the name Jack's on Queen come from? We have a son named Jack. We were talking about opening the store. My husband said how about Jack's on Queen and we all went hmm. He goes yea there is Jack our son but the other letters spelt out our other children’s names and the store is on Queen Street. Our kids still joke that it's named after just one child though. What is the best part of owning a game store? I don't have to keep all my nerdy stuff in my own house, I have this whole other area (Batcave) for all of my stuff. Also the relationships I have formed with my customers. We have met some really great people. What are the challenges with opening a game store? Inventory is very expensive, we originally started with comic books and swords with a little Magic the Gathering and ended up expanding into tabletop games. Also, advertising - it can be hard to know how/where the best place to advertise is. Scott: It is the friendly family atmosphere of it. I first found the store because I wanted to play Blood Bowl. I thought I had to go to Barrie to do it but I was on the GW site and I saw that there was somewhere in Elmvale. I started by playing Blood Bowl and now I run the leagues, I also bring my kids in now. My daughter does RPG and my son plays Magic and they have made friends and the people we are all game together. You don’t get that at other stores because it is basically just a store. It is like Walmart you buy your game and walk out and that's it. They do a few events but here we do a gambit of things. You can sit down talk and chat. If one person has a problem we all sort of get together to help them out. Do you get a lot of non-gamers? Yes, we get a lot of cottagers. Usually, people passing through. I would say that the pinnacle times for Elmvale are when we get the most people. For example, the Maple Syrup festival, people will come in and wonder what this is all about. Most of the people that come here have a specific game in mind but a lot of them will participate in tabletop board game days. Our games generally have a game that they like to play whether it’s Heroclix, Warhammer, Blood Bowl, D&D or Magic. They have one goto game but almost always they will participate in other events, even if it is just sitting down and playing board games. My community, best people on the planet, they are giving, kind, and loving. When something happens to one of us it is like it happens to all of us. People rally around and help one another. We do a fundraiser every year called the Brent Landry memorial RPG day. Brent Landry gamed with some of our customers and he passed away from cystic fibrosis back in 2013. They ran a couple of games to raise money to for cystic fibrosis In Barrie. They became regulars here and asked if we would be interested in hosting and we said, “absolutely.” So we have done it for three years now and each year we have exponentially increased the amount we raised. My community is the best people on the planet. When is the Brent Landry Memorial RPG Day? What are your most popular events? D&D or Magic. D&D is huge we probably have a least four tables every Thursday night. Do you guys participate, just watch or DM? We have people who volunteer who DM. A lot of the tables will have a rotating DM so that one person isn’t always the one doing it. My husband and I play at a table currently. We do Edge of the Empire the RPG which is a lot of fun. I am Wookie. How did you guys build your community? Was it hard to get the word out in a small town? 'A' game. Also, it's long hours particular with Friday Night Magic. You can be at the store till 12 or 1 am sometimes later, especially on pre-release weekends. We sometimes go from 6pm to 6am. Faith, I don’t want to understate that. I am a faith-based person. I do not want to take credit for everything we have. I believe in god and I believe in the power of prayer. There are days when it's rough, there are quite quiet days. So for me, that is a big component of it. You know really helpful customers. Scott has been a customer for a long time, now he works for me. If someone came in and had a question and I was busy with someone he would answer them. Because I think our customers realize if they want our store to be here they have to help support it. If we can’t keep the lights on and the doors open I cannot provide a great community for you to play. So really strong relationship with the customers and the customers stepping forward to really being that beacon of who and what we are. If someone wanted to open a board game store what advice would you give them? Service orientation. Don’t fall in love with your product. Part of the issue you will find when a store opens and close right away when it comes to an industry like this. Is simply that you want everything. You are afraid to sell it. I love games very much and everyone has their favourites, including myself but when you are trying to make a living you have to remember it's a business. You have to make an adequate margin on your product in order to keep your lights on to feed yourselves and to pay whoever you have working for you. You have to treat it like a business you cannot treat it as a hobby. It won't stand if you treat it like a hobby. And service is huge. You have to be appreciative of people who come into your store. If you walk through that door you have to be respected because you came into my place. It is really important to be service oriented and it came easily to me because I did customer service for decades. It has done well to cultivate personal relationships. If people feel comfortable to come here they are going to want to keep coming and they are going to want to bring a friend. It’s very important. Remember it’s a business. Remember your customers shouldn’t come first in terms of the business overall but they should come first when they are in the store. When they are in your space your job is to serve. When you are sitting with your books, the books are the boss. community like I have never seen before. Kim has some interesting and great insight into her corner of this wonderful industry. If we missed anything please let us know, if you want to see a specific store we would love to hear from you.